Up until the Garmin Vivoactive, the perfect fitness device for the truly active person was a pipe dream. Traditional fitness trackers are terrible for actual sport, and offer such base level insights that they're almost useless for people who take their fitness seriously. If you like to get active, a GPS running watch was the best fit for runners and cyclists – but most are expensive and only useful when you're pounding the pavements. And what about people who like more than one sport? For the active person the perfect fitness device did not exist. But along came the Garmin Vivoactive. Arguably the company's first smartwatch, it promises full notifications on the wrist and a dizzying array of sports tracking – and at $249 it's reasonably priced, too. But is it the perfect sports watch? We put it through its paces to find out. Before getting into the nitty gritty of the Vivoactive, it's worth running through its impressive array of features. First, as you'd expect from a Garmin device, it features a variety of sports tracking features– and with the addition of GPS, it's a powerful proposition. That means that running, cycling, walking and swimming are all tracked, and with the accuracy of a GPS system. No accelerometer guess work, proper tracking from the best in the business. A big draw for many will be the addition of golf tracking. Using the built in GPS and Garmin's gigantic repository of 38,000 courses, you can get a stripped back version of the company's golf watches, with yardages to the front, centre and back of the green. That sums up the features of the Vivoactive in a nutshell. It's like a stripped back version of Garmin's huge range of dedicated sports wearables, all rolled into one. A jack-of-all-trades that does the essentials, which for most people, will be completely sufficient. In addition to the sports tracking, the Garmin Vivoactive acts as a smartwatch and fitness tracker, too. It keeps tabs on your daily steps and nightly sleep, and prompts you to move about if you're sat around for too long – and while the analysis isn't as in-depth as a Fitbit or Jawbone device, for people who are genuinely active, those details don't matter that much. The final aspect of the Garmin Vivoactive's Holy Trinity of wearable features is the notifications, which make the device the company's first true smartwatch. It pairs to your smartphone to deliver a host of notifications to the wrist – and it's one of the most impressively open ecosystems we've used – outside of Android Wear. Out of the box the Vivoactive hoovers up texts, calls, WhatsApp, tweets, Uber alerts – basically anything from your smartphone goes to the wrist. Some may argue that it's a little overbearing, adding to your 'digital noise' that a lot of wearables are now trying to solve. But given the likes of the Basis Peak and Fitbit Surge have launched recently with absurdly limited notifications, it's a refreshing change. Yet the Garmin never feels overwhelming. Notifications disappear after around 10 seconds, and are stored in the notifications menu, which is accessed by swiping right. As you may have guessed from the swimming tracking, the Garmin Vivoactive is also waterproof to 5ATM, which means you can swim down to 50m safely. From the impressive list of features, it seems Garmin has produced a miracle device, and it certainly belies its $249price. In fact, in many ways, it's four $249 smartwatches and sports watches rolled into one. However, when it comes to design, the whole thing starts to unravel. The only thing the Vivoactive has going for it visually is its relative thinness, which, at 8mm, is impressive. The visual appearance gets worse. Nestled between the chasm-like bezels is a low-res 205 x 148 LCD touchscreen, that's had its brightness turned down to a point where it's illegible in dull conditions. The left hand button briefly turns on the backlight, for around five seconds. It's a way to save on battery, and it has yielded results but at quite a cost. The low-res screen finishes off a fairly mediocre design job, and the result is that despite the Garmin Vivoactive being in many ways our perfect smartwatch, we just don't want to wear it. Perhaps the complaints over the screen would be mitigated if it was held within a better overall design, but no-one wants to be seen out in the evening with the Vivoactive on their arm. After the extreme negativity of the Garmin's design, the tracking elements are a return to happier areas. The step and sleep tracking, in honesty, are a mixed bag. We had no complaints over the steps, yet the goals seem bizarrely set – especially if you have come from a 10,000 a day type set up. They can be tweaked and set within the app, however. The sleep tracking is fairly mundane too. You get a graph showing your time spent asleep and how restful you were – yet certainly falls behind the likes of Withings and Jawbone for sleep tracking. When it comes to sports, however, it all changes. The presence of GPS means your runs will be accurately tracked, with live pace information and distances, just as you'd expect from a dedicated running watch. That also goes for cycling, swimming and walking too. While some of the advanced information such as vertical oscillation or VO2 max aren't for 90% of runners, the Vivoactive has your needs covered. It even works out your cadence (steps per minute) from the wrist, which is an unusual feature for wrist-worn wearables. 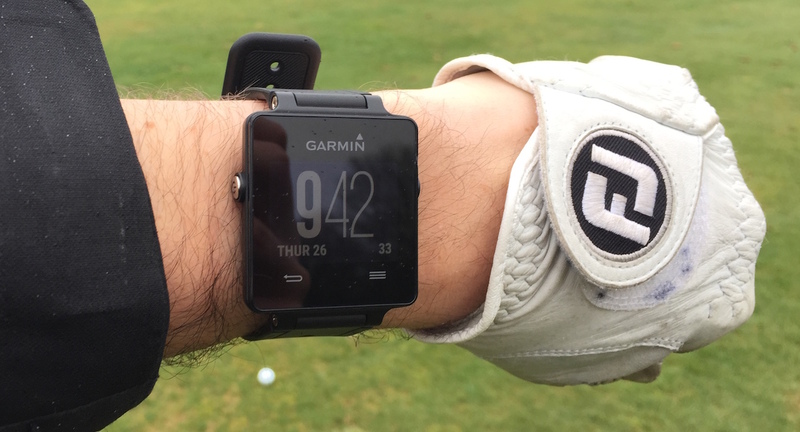 We did take the Vivoactive out to test the golf features, but it seems the feature hadn't been activated by Garmin yet, so we're looking into the problem and will update the review. If you want to get really detailed about your fitness, you can pair the Vivoactive with one of Garmin's heart rate chest straps, to have the data pulled in with the rest of your information. The Vivoactive syncs with the Garmin Connect smartphone app, which is used to view your activity details, daily steps and settings. Garmin Connect is a huge fitness platform, and as well as the powerful app, is a huge online portal that enables you to do everything from earn badges to map out runs. The mobile app is clearly laid out, putting daily activity tracking at the top, and individual workouts, in chronological order at the bottom. All the data is then shown off on clear graphs, offering incredible detail about your workouts, all from your smartphone. We also have to call out the bulletproof syncing, which also impressed. When we fired up the app, it synced within seconds, every time. So many devices have had such flakey Bluetooth syncing (we're looking at you Basis) the experience has been infuriating. Top marks to Garmin. Garmin claims a three week battery life with 10 hours of GPS tracking, and while we found it to be slightly generous compared to our findings, it's still extremely impressive. With all-day use we found that a week would be a rough estimate with heavy use of notifications but no tracked sport. A round of golf ate away around half the battery, which does back up the 10 hours of GPS tracking, which means a days hiking is well within its reach. For the fitness fanatic, the Garmin Vivoactive is not just one of the best sports watches, but the best smartwatches out there. For the first time, Garmin has blended an incredible set of fitness features with top notch notifications, to create the first truly every day sports wearable. However, the dated design and questionable screen tech call into doubt whether anyone would want to wear the device every day, and that's a crying shame.